The idea behind this innovative Date Picker is to reduce the clicks to select Month and Year from a date-picker control. In normal date-picker controls, user should click on a link, one way or other, to list the Months and Years. All the months and more years are always listed in this new eZe DatePicker control to select it quickly. In this release Month and Year selection panel added to the left side of the normal Date Picker to give an eZe access to all the months and more years, without an extra click. 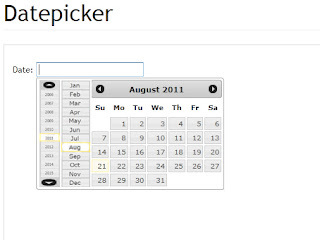 I am trying to add this feature to JQuery UI, by contributing it to the official JQuery DatePicker. There is a lot of room for improvements. So, please give your valuable feedback to improve it. Known Issue: Datepicker jumping up on Year/Month selection in Google Chrome. This is because, it is within an iFrame. This is not a bug of the control. It will be fixed soon. I have incorporated some of the features suggested here. The main one is regarding the year selection. Great show man...can u share the source code??? @Abhi: I just customized the JQuery DatePicker to bring this feature. The code is not neat. Also, I am planning to add some configuration options. I will publish the code when I complete it. I am planning to provide it with the beta release. Nice. But since you have provided +10 and -10. The years list should not move. Now when I select a previous or next year, the list is moved up or down accordingly. Cool pauls. Nice to see your website and the tool is just amazing. never saw something like this. nice work. i like your caption as well.